Love Patchen! Thanks for this! Patchen does not get the respect he is due. He read some poems with a jazz combo - is it out on CD? Great writer, thank you for this. Patchen is a great artist. I don't agree with his eternity. 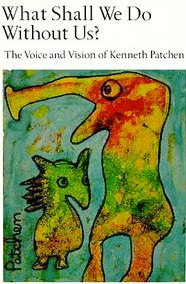 Yes - Patchen's recording with the Canadian Jazz group is available on CD. Click here to order it.